The picturesque Linkwood distillery, founded in 1821, is one of the Speyside region’s hidden gems. The Victorian buildings remain despite much updating and expansion during the 1960’s and 70’s. Swans and ducks swim on the distillery dam which provides cooling water for the condensers. Uplifting aromas of apple, tea leaves and rose water emerge with a little camphor oil infused. The palate delivers much of the same in a subtle, elegant way and draws to a close with some toasted almonds. 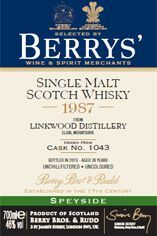 Peter Brown established the Linkwood distillery in 1821 and the first distillation took place in 1824. After his death, his son, William Brown cemented the reputation of the distillery over the next 30 years. In 1936 the distillery was taken over by the Distillers Company (now Diageo) and like many other distilleries, it was closed during World War II. After the war, Roderick Mackenzie reopened the distillery and stayed in helm for the next 18 years. Mackenzie was a passionate believer in the qualities that the distillery could draw from its tradition and heritage, so he resisted any change at Linkwood, and even forbade the removal of even spider webs. Nevertheless in 1971 Linkwood tripled its production capacity. Despite these alterations, the Linkwood distillery has always kept its traditional character. The distillery was closed from 1985 up to 1990 when the old side reopened for production a few months per year. Only 1 or 2% of the production is marketed as single malt, the remaining being used in the blends of the Diageo group such as Haig, Bells and Dimple and Jonnie Walker.